I love roses. Now that I think of it, they might just be my favorite flowers. The color doesn’t really matter – I’ve gotten red, pink, orange and blue roses. I’ve even gotten glitter-covered roses. Give me a rose – any color – and I’ll happily take it. The only downside to a rose is, that it lives such a short life. It can barely last a week. Or am I just a bad florist? Okay, I already know the answer, because somehow we’ve come to the agreement, that my man handles all the plants in our home. I can’t be the only one, right? Anyway – I love roses, but I wish they would last for an eternity. So you know I was excited, when a company called Eternity Rose contacted me and I got this beautiful pink rose jewellery set. 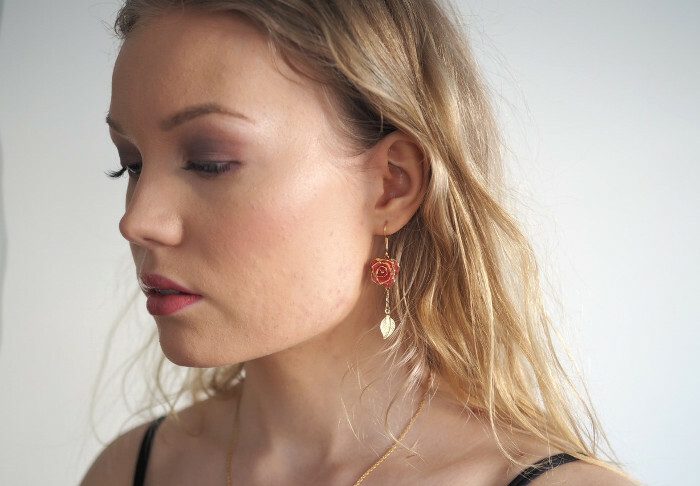 What’s unique about this jewellery is, that it’s made from real rose petals, which are glazed and gold-trimmed. 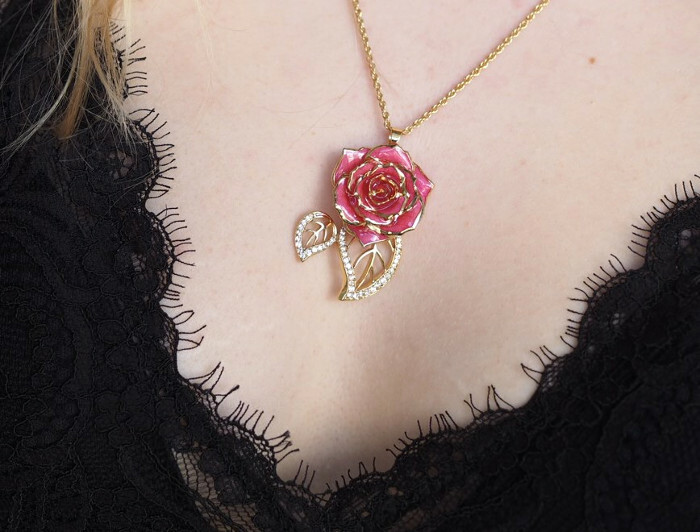 The fact, that they contain real rose petals adds a nice little touch to already beautiful jewellery. I think this earring and pendant set was even more beautiful in person and I really like how graceful it looks. I’ve always considered myself more of a silver-gal, but nowadays I’ve really enjoyed rose-gold and gold things. It’s always boring to limit yourself, so why not try new things, new colors – or new jewellery? You can choose one piece of jewellery from Eternity Rose (either earrings or a pendant). You can choose the color and the style. You can participate by answering this question: what is your favorite flower? Make sure to also include in the comment your email address and the item you would like to win. Good luck to you all! Giveaway is open internationally till 30.4.18. Metsätähti on lempikukkani 🙂 leikkokukista ruusu kylläkin. Olisipa vaikea mutta ihana valinta jos voitto sattuisi kohdalle! Violetti ruusu-sydän -kaulakoru on lempparini. Ruusu on suosikkikukkani. Tuollainen vaaleanpunainen kaulakoru ruusulla olisi ihana, mikä sinullakin on kuvassa. 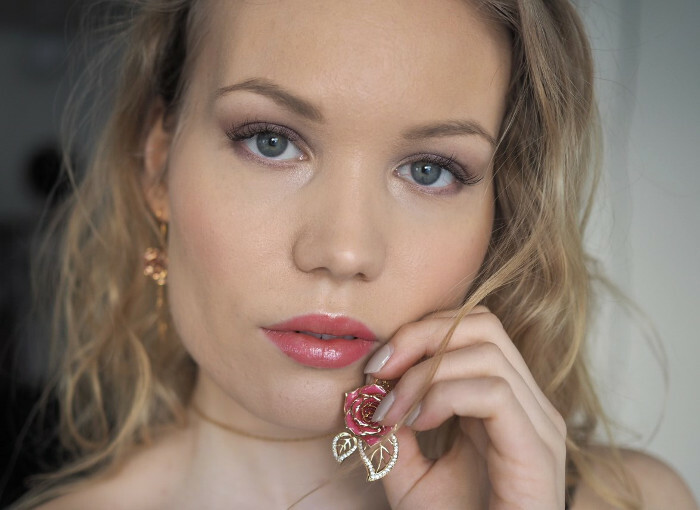 Lempikukkani on lilja 🙂 Jos voitto osuisi kohdalleni niin valitsisin korvakorut Pink Glazed Rose Earrings in 24K Gold. The earrings are so beautiful, definitely my style and I would love to win them!! I love roses too, my fave would be white or pink roses, they are so romantic!!! Thank you Charlotta! !